-You know the theory that forcing a smile can actually improve your mood? New research shows that may not be as true as we initially believed. But at Aspen Dental Care, we won’t ever question the power of a smile. And if you are missing teeth or dealing with an ill-fitting denture, you especially know the value that a complete smile adds to your life. Nothing replaces missing teeth like dental implants in Fort Collins, CO. Dr. Lindsey can evaluate your candidacy for implant dentistry and help you enjoy this strong, sturdy option in tooth replacement. Implant dentistry offers patients a truly comprehensive solution following tooth loss. Nothing else replaces your missing tooth as well as the root that provides its support. Other options, like a non-implant retained bridge or denture, only replace the visible portion of the tooth. But without the root, the jaw will slowly weaken and lose its shape. This degeneration causes even more tooth loss later on. Dental implants are small cylinders made of titanium, a biocompatible material that has a valuable feature. Titanium is able to fuse with bone matter, meaning after their surgical placement, dental implants slowly stabilize in the jaw through the process known as osseointegration. It takes anywhere from four to eight months to complete, but osseointegration provides unmatched stability for the tooth replacement (a crown or denture) that is attached on top. When cared for properly, dental implants can be expected to last the wearer’s lifetime. Proper maintenance of dental implants involves regular brushing, flossing, and periodic visits to your dentist. In rare cases, the condition known as peri-implantitis causes initially successful dental implants to fail. Prevent peri-implantitis by removing plaque and preventing tartar build up with excellent dental hygiene. Ready to Get Started With Your Dental Implants? Dental implants can save your smile — so don’t wait to get started with implant dentistry. 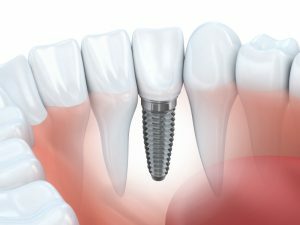 While most patients who wish to replace their teeth with dental implants are well-suited for the replacement option, there are a few factors that could get in the way of a successful dental implant procedure. People should have healthy jawbone structure or be able to undergo bone augmentation preceding their dental implants, as necessary. Adequate oral and overall health are also necessary components of successful dental implants. The only way to know for sure whether or not you are fit for dental implants is to schedule an appointment with your implant dentist. You and Dr. Lindsey can discuss your options in tooth replacement and decide on which is best for your smile. Contact our office to schedule an appointment with your dentist in Fort Collins, CO today!